The sweet potatoes that appear on the Thanksgiving dinner table as candied yams or soufflés adorned with marshmallows are a staple food of the U.S. South. In 1991, the Center for Science in the Public Interest placed sweet potatoes at the top of its list of the 18 most nutritious vegetables, according to the Mississippi Sweet Potato Council. This nutrient-dense root scored 101 points more than the closest rival, the white potato. Sweet potatoes garnered this score for their complex carbohydrates, fiber, vitamins and minerals. The serving size for boiled sweet potatos is 1/2 cup. This amount has 125 calories, with 2.3 g of protein. The sweet potato's carbohydrate content totals 29 g, or 10 percent of the Daily Value for a 2,000-calorie diet. The sugar content for this serving is 9 g. It is a good source of dietary fiber, with 4 g per serving, or 16 percent of the DV. The 1/2-cup serving has 0.23 g of fat, but no cholesterol. 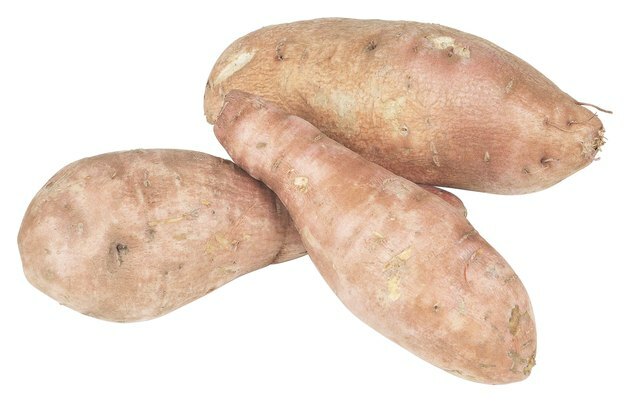 A 1/2-cup serving of boiled sweet potato provides 25,814 international units of vitamin A, or 516 percent of the DV. The vitamin C content is 21 mg, 35 percent of the DV. Sweet potatoes also provide 14 percent of the DV for vitamin B-6 with 0.27 mg per serving. They are a good source of pantothenic acid, providing 0.95 mg, 10 percent of the DV. The thiamine content totals 0.09 mg or 6 percent of the DV. This serving provides less than 5 percent of the DV for other vitamins. Manganese is the main mineral that this serving of sweet potatoes provides. It has 22 percent of the DV, or 0.43 mg. The potassium content is 11 percent, at 377 mg per serving. A serving of sweet potatoes contributes 6 percent of the DV for iron, but less than 5 percent of the DV for other minerals.